This article was produced as part of our Moving Stories project. Pakistan is highly exposed to the impacts of climate change. The IPCC have associated increasing temperatures with the severity of the monsoon rains and predict an increase in severity. Northern Pakistan faces increased risk of flooding and landslides. An increase of cyclonic activity will impact Southern Pakistan and the city of Karachi is at high risk from sea-level rise, prolonged cyclonic activity, and greater salt-water intrusion. Pakistan’s vulnerability is increased due to its reliance upon water from the Indus river and tributaries, which supply two thirds of the water the county uses for irrigation and domestic use. The Indus is fed by the Himalayan glaciers, which are receding significantly, with the likelihood of them disappearing by the year 2035. Other factors make Pakistan vulnerable to the impacts of climate change. Nearly half of the population is dependent on agricultural livelihoods; there is considerable rural poverty, urban unrest, land degradation and shortfalls in food production. Further urbanisation and industrialisation place more pressure upon water supplies which are already threatened by climate change. In July 2010, Pakistan was affected by heavy monsoon rains, which led to massive flooding in the Indus River basin. More than 10 million people were displaced, with about 20% of the country under water. The death toll was around 2,000. The provision of international aid was widely considered insufficient, with millions of farmers housed in refugee camps, and crops and cattle destroyed. Flooding struck again in 2011. The disaster affected 18 million people and destroyed 1.7 million homes. In August 2012 following the monsoon floods, the region of Tharparkar experienced significant drought, forcing 600,000 people dependent on rainfed agriculture to internally migrate. The International Federation of Red Cross (IFRC) put the number of displaced people at 250,000. The total number of people affected stands at 4.4 million. Floods and natural disasters cause considerable forced migration within Pakistan. Pakistan receives roughly 8% of the total global funding available for dealing with displacement. There are 745,000 IDPs , the majority fleeing from fighting in Federally Administered Tribal Areas (FATA). But despite such a large IDP population, Pakistan is also a destination for international migrants in the region. It is the top destination for Somali refugees. 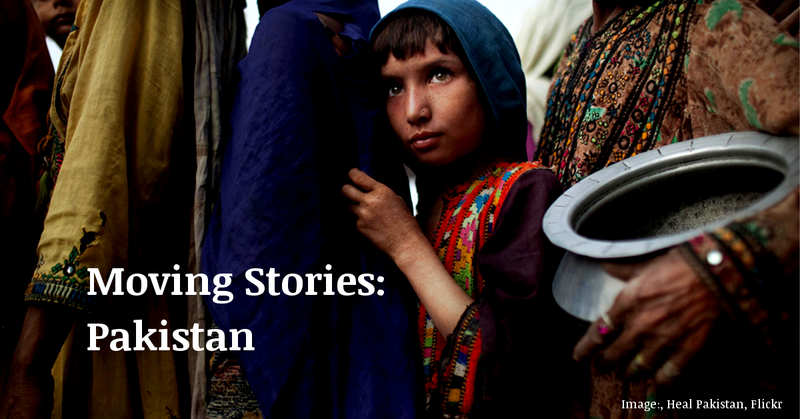 There are currently 1.6 million Afghan refugees in Pakistan. The country is currently experiencing the world’s largest protracted refugee situation. As well as vast numbers of displacees and the absorption of neighbouring refugees, Pakistan also has a long history of voluntary migration, which is largely split between unskilled labourers travelling to the Emirates and Dubai and more skilled workers heading for Europe and the US. Pakistani diasporas are amongst the largest and most extensive in the world, supplying remittances to families in Pakistan of $12 billion a year. The IPCC predicted that “circular migration patterns, such as those punctuated by shocks of migrants following extreme weather events, could be expected”. This is supported by the Asia Development Bank which suggests that “environmental factors are already an important driver in migration” and that “floods, cyclones and desertification have led in recent years to significant population movements, mostly from rural to urban areas”. A fully referenced version of this article is part of our Moving Stories report.